Where have all the concentrates gone? Seems to me less and less dispensaries are carrying concentrates. Instead of every other dispensary carrying concentrate, when I go online to pick out my next medicinal destination it is more like one in four or even one in five for some areas. Why take away a form of consumption that is healthier? One hit of concentrate can equal the potency of up to six hits off of a regular hand pipe. You have just reduced your inhalation of smoke, which is the only carcinogenic material you would consume when using marijuana. Concentrates are obviously more potent and you would need a smaller amount to achieve desired results. Besides being a healthier form of consuming marijuana, the medicinal value of concentrates is great as well, since it it is a concentrated amount of THC and/or CBD. It has been used successfully in treating different forms of cancer as well as schizophrenia. So, of course if it can treat such extreme diseases, it will annihilate your everyday nausea, anxiety, or many other symptoms many medicinal users suffer from with a much lower dose. Rich, the manager from Rite Greens in Santa Ana, seems to think the lack of concentrates in LA are due to a lack of supply and no substantial demand for the product. “Recently there has been an upturn in concentrate purchases here at Rite Greens, all types of concentrates are gaining in popularity,” Rich said. With good reason! I chose to interview Rich on this subject because I consider Rite Greens to be one of the leading authorities in California on concentrates. They have an incredible selection of all different types, and strengths of medicinal quality concentrates, edibles, and flowers. Next issue I will be reviewing six different strains from their large quality menu of cannabis. Concentrates offer an alternative way of consuming the healing components of marijuana. A healthier way. 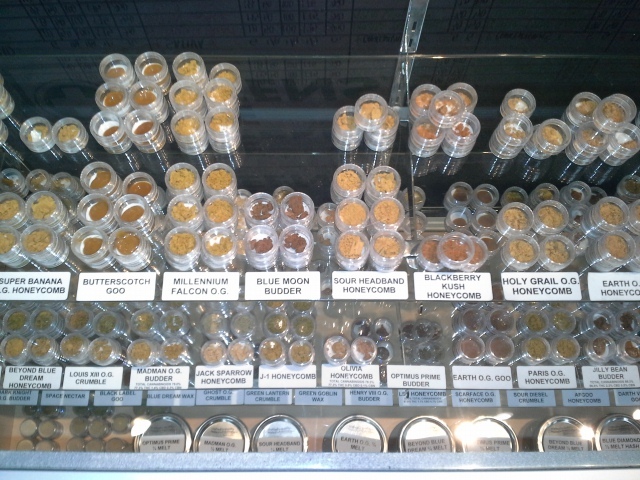 I hope to be able to find concentrates at whatever dispensary I visit in the future. Let’s keep moving forward in making this medical miracle available to the people who need it, not backwards by taking it away. Author’s post-script note: Since I live in a rural area sometimes it is hard to get to a dispensary, so I use the Goddess Delivers and they come all the way out to my house in the middle of nowhere to deliver my meds. I am a big fan of their Kiva chocolate bars. They are delicious and just an 1/8th of a bar will do you good! Recently when I ordered they had CBD lozenges available, which I had never tried. Well, I tell you, if you have not tried these, you need to. The lozenges are high CBD and low THC, only 8mg of THC while containing 20mg of CBD. These made me feel ready to conquer my day, no doubt that I will be ordering them again. I am a sativa girl and generally I prefer my edibles at the end of the work day, but these lozenges are a definite get up n go kind of medication. Discreet, potent, and highly effective for those of you who medicate for focus and motivation. I highly recommend these as a start your day med! Next Next post: Your Chance to Run Away and Join the Circus IS NOW.